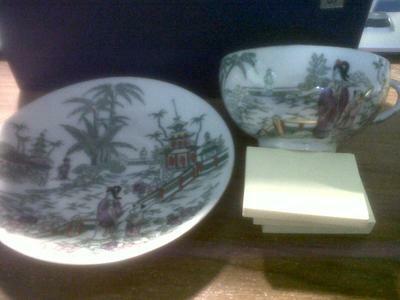 hello - Can anyone identify the attached picture of a tea cup and saucer with a Chinese pattern on. More information on when they were made would be great. your help would be much appreciated. Looks like a Geisha Girl porcelain ? My grandmother used to have a set of Geisha Girl porcelain cups, they have a beautiful picture in the bottom of the cup of a Geisha in Lithophane. I dont remember what the outside of her cups had on them exactly. I don't believe that all the Geisha Girl porcelain has the Lithophane though, that I'm not sure of. Just a guess ;) Good luck ! Vickie C.